The UK's first zero carbon (code 6), affordable, certified Passivhaus. It uses locally sourced and manufactured materials and components, providing a prototype for sustainable locally tailored architecture across Wales and the UK. The Larch House is the UK’s first zero carbon (code 6), low cost, Certified Passive House (or Passivhaus), built as prototype social housing and launched at the 2010 National Eisteddfod for Wales. Designed by bere:architects, for the United Welsh Housing Association and the Building Research Establishment, the three bedroom house has been built 1000ft above sea level in an exposed and misty hilltop location in Ebbw Vale, Wales. Despite this, most energy needs are met by heat from the sun, occupants and appliances. The Larch House is designed to generate as much energy from the sun in the summer months as it uses for the whole year making it Zero Carbon by UK definition and showing how we can live comfortably with minimal impact on the natural world. 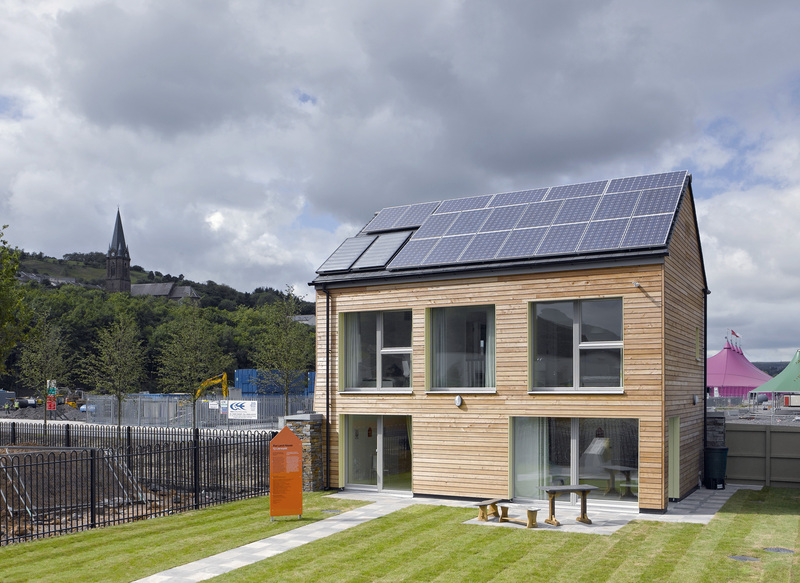 The Larch House has an estimated income from the feed-in tariff over expenditure, of £1300 a year. It is important that we build houses that reduce their tenants’ household energy bills and protect people from fuel poverty. The Larch House incorporates sustainable features both in the finished product and in the building process. We are striving for a perfect balance; incorporating greener methods of building and offering benefits to tenants through lower energy bills and improved comfort. Is Wales set to become the new Vorarlberg of the UK? "it's one in a million"
"eco super-homes at the cutting edge of sustainable housing."